I often make chapathi/paratha for our lunch along with curry or sometimes with simple pickled raitha. 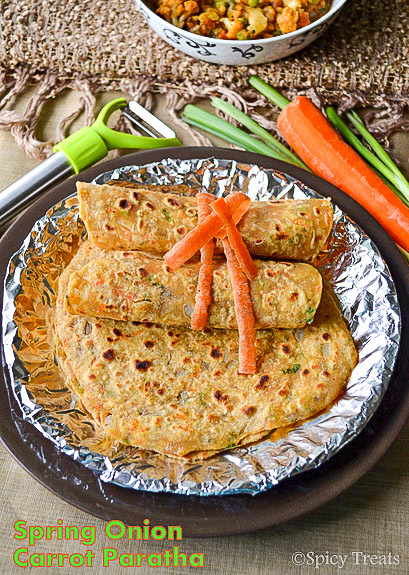 This time i tried this flavor rich, delicious and healthy Spring Onion Carrot Paratha. Spring onion and carrot makes an excellent combo and this paratha turned out super soft and tasty. These parathas are perfect for lunch box and also a great travel time recipe too. The recipe as follows..
Wash spring onions and carrots, finely chop spring onions along with bulb and greens, shred carrots n keep ready. Take a mixing bowl, add first six ingredients "flour-salt" combine well. Then to this flour mixture add finely chopped spring onions and shredded carrots mix everything well and use water little by little and make it to a smooth dough. Apply tsp of oil and knead the dough for few minutes and cover the dough with damp cloth and keep aside for 20-30 minutes. 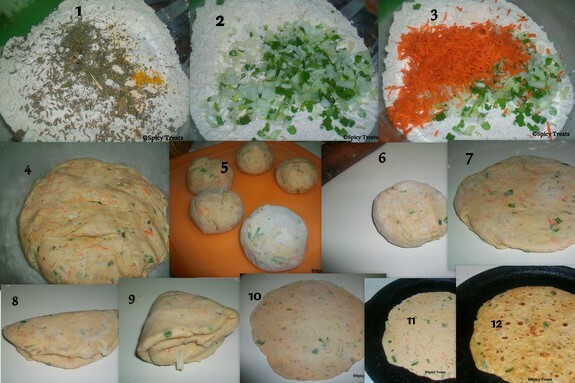 After that, divide the dough in to 15 lemon sized balls, on a well floured surface keep one ball shaped dough using rolling pin roll it to 8" paratha or you can try rolling like the method shown in the pictures. do repeat the same procedure for all the remaining dough and keep ready. Heat tawa/griddle, when its really hot, place one paratha at a time and toast them with or without oil. Once done, remove from the tawa and serve hot or its ready to pack for lunch box. that looks so good. loved ur pics!! i love all these veggie parathas. I too had plans of making parathas..with spring onion..will try some time!! Wat a healthy and flavourful paratha..yumm,inviting. Wow!! !delicious and excellent paratha sounds inviting..
love this combinations.. parathas are the most versatile and appetizing whole meals! Yummy parathas Sangee...Thanks for linking it to the event. love the combo n presentation sangee!! I am sure this must have tasted great. lovely combo!!!! paratha looks tasty with added carrot n spring onion,a good combo!! Awesome. I can imagine how delicious this must have tasted with all the veggie stuffing. spring onion combination is different !!!! very innovative parathas, should have been very delicious and flavourful..